* Imagine the most delicious and decadent milk chocolate in the world. That’s what this smells like. * There is some cherry and rum at the top to support the chocolate, but it really is all about the chocolate. * Slight projection for the first thirty minutes or so, and then it becomes a skin scent. * The cherry/rum melts away and a soft vanilla comes in to join the dominant, sweet chocolate. * The scent slowly fades into a delicious soft chocolate which last for about eight hours. 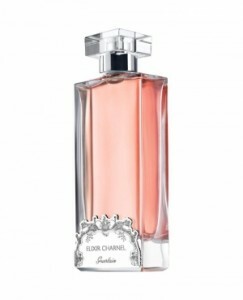 Summary: Gourmand Coquin is the first fragrance I bought from the Guerlain boutique in Las Vegas. It is also my comparison that I use when I am considering purchasing an expensive fragrance. I think to myself, do I love it as much as Gourmand Coquin? Everytime I wear this, I sniff myself constantly. It is delicious, edible, and amazing. This is not the chocolate scent you would get from a celebrity fragrance or something cheap from the mall – this is high-end, ultra luxe and rich- if there was chocolate nicer than Godiva/Lindt/etc. – that would be the chocolate that you smell here. Although you would probably wear this as an evening scent, it works as an office scent because it stays close to the skin. It is marketed as feminine, but guys could easily wear it. Only two drawbacks – as a Guerlain exclusive, it is insanely expensive at $260 per bottle. Also, the word is that it will be discontinued. Although it might anger me, I wish Guerlain would change this from an exclusive to a mainstream fragrance so more people could enjoy and experience it. If Gourman Coquin was marketed in department stores like their other mainstream scents, it would be an international smash. Disclaimer: No disclaimer needed. I bought a full bottle. Picture from Guerlain website. Nothing makes me happier than a grown-up gourmand.